James Carvin has a certain super power designed for loving you. 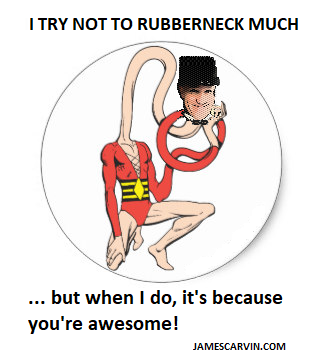 Elastic Man is just part of the story. Now that I’ve started from the middle and worked backwards and brought things to the present in multiples of seven, I’m all finished telling the story of my life. It remains that I should explain a dream that I had last night. In the dream, I was the entire Universe and I was reflecting on myself through cosmic rubbernecking. Rubbernecking is the tendency we have to slow down so we can see things better. This happens on highways whenever anything unusual has happened. It sometimes brings traffic to a complete stop. This is the kind of dream a driver who thinks a lot will have. Maybe it’s time to wake up and smell the coffee. Are you ready to travel through time? Before telling you my dream, let me pause a moment to mention that I included SUPER CHRIS in the My Story section of this blog for a reason. When you have a moment, whether before or after you read this, get out your headphones and grab a cup of coffee. Really focus on SUPER CHRIS. St. Christopher, as the patron saint of travelers, knows all about rubber necking. And this dream, just like that video, is a metaphor. Think poetry. So take another sip of that coffee. I have some thoughts to share on the meaning of life. 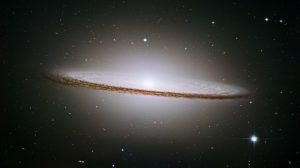 NASA/ESA Hubble Space Telescope catches, the Sombrero galaxy, Messier 104 (M104). In this dream, I was the Universe, as I was saying. And what happened in this dream, is that I kept seeing myself in various places along the strands of timelines that I had, which were neurally connected to myself as the Universe, each telling a story, all connected to the whole. I discovered in this dream that examining any one part of any story of my life, always involved rubbernecking from the whole, which operates at quantum speed. 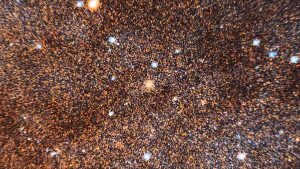 The NASA/ESA Hubble Space Telescope reveals thousands of colourful galaxies swimming in the inky blackness of space. A few foreground stars from our own galaxy, the Milky Way, are also visible. One analogy is the body. Just as focusing on any one sensation in the body, requires concentration, as the brain directs its attention to what it considers important among its many signals always coming in, and involves multiple neural cells in the process, so does the whole Universe rubberneck a bit, in order to stop and hear the story of its individual parts. It isn’t just the fantasy of a dream. There is a scientific side to this. Quantum speed is omnipresent for the whole. And since time and space are in a continuum, quantum speed accesses any and all points of time for every strand of truth-story simultaneously, but in order for any parts of this story to be appreciated for all that they are, cosmic rubbernecking takes place. Rubbernecking involves multiple vehicles on the road just as consciousness involves multiple cells in the body. Or is it the other way around? It doesn’t matter. This is a metaphor. Is as does. Does as is. 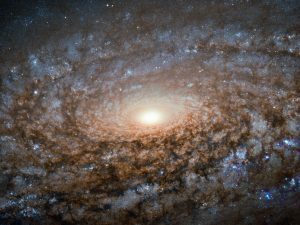 The spiral galaxy NGC 3521 from the NASA/ESA Hubble Space Telescope is not out of focus. In flocculent spirals, fluffy patches of stars and dust show up here and there throughout their discs. That’s how I feel today. Flocculent. Quantum speed is the one thing that is greater than the speed of light, including the speed of light squared. It doesn’t actually travel. It unifies the whole through the fields that pertain to the whole. The interconnectedness of its entangled particles is the glue that unites the entire Universe despite the fact that it is accelerating its expansion well beyond the point that we can’t see the majority of its light and have no molecular ability to see the majority of our own Universe. 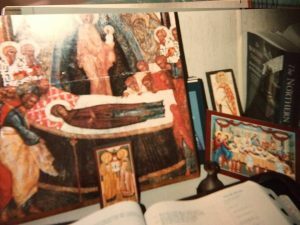 The icon of the Holy Dormition is one that depicts Christ in front of the Door, which is the doorway to the Uncreated Light, which is God Himself. Here He receives Mary in the resurrection. Have you woken from your sleep? The Bible says that the heavens are declaring the glory of God. Here you have it. God’s light is beyond the ability to see in our visible horizon as molecular beings ground by gravity to a small quarter of the endless whole. The ancients depict God as the Son standing in a doorway of darkness because He is the “Uncreated Light.” They were describing the Quantum Jesus of the heavens’ declaration but just didn’t know about quantum theory yet. But I’ll stop and observe the parallel. Can you do this with me? It’s not that Jesus is the entanglement. Goodness knows. Entangled particles and quantum fields are the least of the omniscient imagination of the totality of abstract truth. As amazing as they may seem to us as new things a few particle physicists have come to appreciate, an innumerable number of other unifying fields could be made to occur from absolute nothingness, as well. 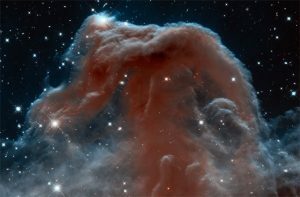 Is there an elephant in this nebula? Having considered all possibilities, what quantum formulas would the totality of truth, independent of any creation, understand and utilize in order to maximize awesomeness? I explained this in SUPER CHRIS. It’s the core principal of foundational cosmostrophy. And it solves the unification problem for all things as first axiom while scientists hope in vain to discover its formula and can’t even get past the fact that observation obscures the results. Clearly an exponentially expanding Universe is a part of that. It’s what cosmologists are observing. One thing after another that they find continues to affirm the first cosmostrophic axiom. The purpose of life is the maximization of awesomeness. And the cosmologists have noticed cosmic rubbernecking too. For some reason, there is a connection between observing experiments and the results. Look it up. Why does the double slot experiment produce the results that it does? 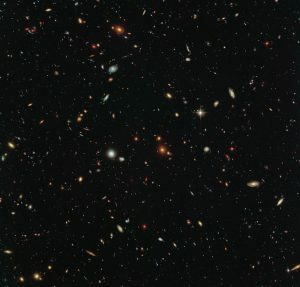 Why is consciousness connected to particle physics? Because two mysteries are better than one? No. Because the double slot experiment is showing them that observation is affecting results. The Andromeda Galaxy is the closest to our own Milky Way. Possibilities are endless. Andromeda has hundreds of millions of stars all with their solar system stories. The observation about observation is perhaps “telling.” To appreciate any one moment of beauty maximized awesomeness has, cosmic rubbernecking is involved. On many levels it may not be required but in this dream it was the way of things and one way or another, there is definitely a difference in speed, a quantum difference. 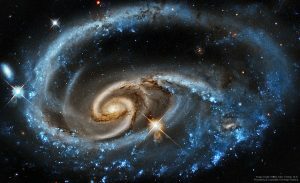 But the Universe as a whole doesn’t necessarily see itself in motion. The motion is just a dimension or aspect of what it is. 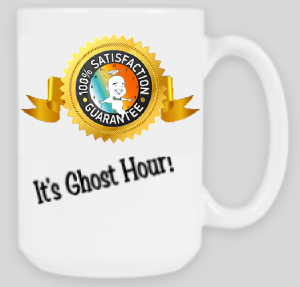 In order to examine its own magnificence, it transcends time. And so that’s what happened in my dream. First I would be with the whole Universe, outside of any moment. And then the Universe would slow me down and bring me to one moment or other in my life. It did so because those moments were beautiful and worth enjoying in the midst of its own total glory. 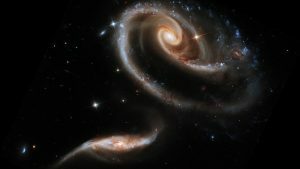 The larger galaxy in the UGC 1810 – UGC 1813 pair has a mass that is about five times that of the smaller galaxy. Both are so vast. How are we connected? You and I? This it did for me, as me. But as itself, it is a total doing as total being, so I would project that it involves every you too. It may well be that individual parts can’t comprehend the whole but that doesn’t mean that the whole can’t comprehend the individual parts. And I was involved in that comprehension. You are too, in the paths you observe. And if I can see your beauty, I don’t know whether it will be through my own eyes or those of the whole. Does it matter? I simply ask the whole to show me. Because you matter. And it would be awesome if I could know the beautiful parts of you. Wouldn’t it be? Yes, it would. So then I woke up. Having slowed down. Having backed up. Having advanced forward. Having returned. Having revisited. I was awake. And I thought of you. Axiom number one: If it is awesome, it will be. Therefore, I will be with you and know you in all of your glory. What is more appropriate for Father’s Day than SUPER PAPA, the second in my Super Series!?! In this video I lay out the heart of my foundational cosmostrophy. There is a cause of all causes and its purpose is to maximize awesomeness. The acronym that describes it is SUPER PAPA. The comments below would be a great place to discuss why maximized awesomeness is inevitable. Subscribe to comment. Share with a friend!